← New Mersenne prime (probably)! 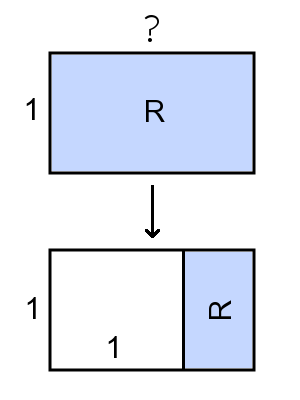 To recap: Suppose you have a rectangle which is one unit tall and has this special property: if you cut off a square piece from the end of the rectangle, you’re left with a smaller rectangle that has the same proportions as the original rectangle. How long is the original rectangle? Can you solve for x from here without reading the rest of the solution? To solve this equation we can first multiply both sides by x, which gives us the equation . Moving the 1 to the other side yields . Hmm… haven’t we seen this equation somewhere before!? That’s right, the width of the rectangle is the golden ratio, ! (We want the positive solution of the equation, although it is interesting to think about what could be meant by a rectangle with negative width). Astounding. I’ll leave it to you to think about what the connection is between infinite continued fractions and recursively defined rectangles. This entry was posted in famous numbers, golden ratio, solutions. Bookmark the permalink.